FORT MYERS, Fla. – Each year, the Fall Instructional League provides us here at SoxProspects.com with the opportunity to catch 50 or so of the system’s young prospects in one place at the end of a long season. This year, Director of Scouting Ian Cundall spent four days at Instructs. These are his reports from Saturday, September 24, when the Red Sox took on the Twins across town at the CenturyLink Sports Complex. The 12th pick overall in June’s draft, left-hander Jason Groome, started the game, throwing two scoreless innings, striking out three and walking one. The first thing that stands out with Groome is his build, as he does not look like a typical 18-year-old. He has a wide, mature frame and looks all of his listed 6-foot-6, 220 pounds. An up-close look at him gave me the impression that he has a body that might need some watching, given how he is built now and his youth. He has the frame to support added weight, but whether that is good or bad weight will depend on how he maintains his body and how much work he puts in off the field, both during the offseason and in-season. Groome’s delivery is remarkably easy, and even though his velocity was down a tick from when I saw him earlier this month with Short-Season A Lowell, he still sat 89-92 mph, touching 93 mph. Given that Groome is at the end of a long year spanning high school and pro ball, it is not a surprise that his velocity is down a tick. With the ease of his delivery and arm action, as well as his youth, as he matures I expect him to add a few miles per hour to the pitch, though I would not be surprised if he sat in the low-90s generally, with the ability to ramp up if the situation calls for it. Because of his height and the extension he gets over his front side, the pitch had downhill plane and late life, jumping on hitters. The pitch elicited some bad swings and got two strikeouts, both against left-handed hitters. The pitch showed arm-side run at times and cut on others, as shown on the two strikeouts. On the first, he started the fastball just off the plate and brought it back over the outside corner to freeze the hitter. On the second, the pitch showed cut on the inner half, again freezing the hitter. Groome’s control did leave him a few times during the outing. He did a good job fighting back on one occasion in the first inning, retiring the hitter, but he did lose another batter in the second. His command and control of the fastball—particularly considering his issues when I saw him earlier this season—still need refinement and will be key in determining how quickly he progresses through the system. Groome’s best pitch, as expected, was his curveball, and it showed better on this occasion than in the outing I saw with Lowell. He threw it 75-79 mph, and the pitch flashed plus-plus potential. It is a true weapon, one of the best curveballs I have seen from a minor leaguer this year—across all levels. The pitch has 1-to-7 shape, depth, and late finish. He has advanced feel for the offering and really snaps it off. He can throw the pitch for strikes or bury it down and out of the zone to get a swing-and-miss when ahead in the count. Groome also featured his changeup a few times during the outing, an offering he has had to throw very little before turning pro. While the pitch is definitely behind his curveball, it has above-average potential. Groome threw the pitch 81-83 mph. His arm speed varied some when throwing it, but the pitch showed late downward action at its best. It was only a two-inning stint, but Groome’s advanced three-pitch mix was on display, and it’s not a stretch to project all three to be at least above-average, if not better. Given his size, delivery, youth, and left-handedness, he has the makings of one of the top pitching prospects in not just the Red Sox system, but all of baseball. There are definitely areas to improve upon, and his youth and frame bring in some risk to the equation, but Groome’s upside on the mound is significant. 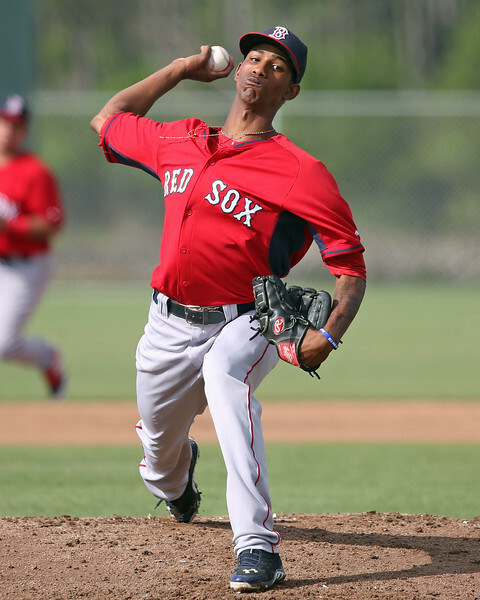 This is the third consecutive year I have seen 21-year-old right-hander Gerson Bautista at Instructs, and he looks to have taken a step forward both with his delivery and secondary offerings. Bautista—who split this year between the Lowell and Greenville bullpens, striking out a batter an inning over 35 1/3 innings—is still tall and lanky with a thin waist, but his arm strength is legitimate. His arm action looked a little cleaner than it did when he was in Lowell. It is still long with a loop in back, but looked a little shorter coming forward, and that allowed him to stay on line to the plate better. He also landed a little softer and more on balance. Because of the effort that still remains in his delivery, his command and control will come and go, as it did in this outing, but he has a live arm and his secondary offerings showed potential. Bautista has a quick arm and sat 95-97 mph, with the pitch showing life. More encouragingly, Bautista showed off a 91-93 mph splitter, something he didn’t show when he was in Lowell this year, where his primary secondary was his slider and he mixed in a below-average changeup in the mid-80s. The splitter showed late dive, and even though there is not much separation with his fastball, it still worked due to its late movement, looking like a fastball until diving late down in the zone. Bautista also threw one breaking ball at 86 mph that was likely a slider but looked more like a power curveball, as it was vertical and lacked tilt. Like Victor Diaz, who I saw the day before, Bautista is another right-hander with premium velocity whose secondaries seem to have a taken a step forward. Bautista still has a long way to go developmentally, but the improvements he has made going back to 2014 are impressive. If he continues to carry those forward, he has the upside of a major league-quality reliever.